The home kitchen is one room that is used every day, regardless of how busy we are. From family meals to after school snacks, kitchens are used by every member of the family. Make your kitchen easier to manage and more friendly for your family and guests with a new kitchen island! A kitchen island will make food preparation a snap and give you an informal place to entertain while you cook or even for dining. At its most basic, an island can be nothing more than a table that you drag into the kitchen, but why settle for that? A custom island can include multi level surfaces for greater utility, dedicated places for small appliances, sinks, and both warming drawers and refrigeration units. The variety of tasks that can be handled at your kitchen island make your job much easier, and allows you to enlist help for your kitchen tasks. With multiple areas for meal preparation, you can plan your tasks as you like, without considerations of space. Kitchen islands can also be handy places for snacks and informal meals. Instead of carrying all of the food to the dining room or breakfast nook, your kitchen island becomes a second dining area with just a few stools. A kitchen island also makes a beautiful addition to your kitchen. With materials such as granite, stone, and wood (think butcher’s block), it is easy to use a kitchen island for redecoration, not just renovation. 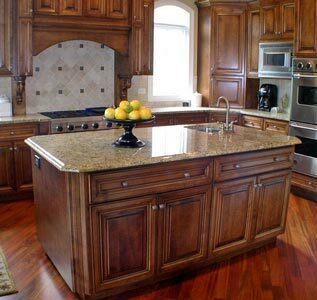 If you choose an island with premium materials, such as granite or stone, you are increasing your home’s value at the same time. Real estate research has shown time and again that premium materials are a major selling point for homes. If you are looking for something new for your kitchen, a kitchen island should be your first choice. Utility, beauty, and a good investment all come in one package. Outer Banks Custom Kitchens is your place for kitchen islands in Hatteras . Call us to discuss your plans and desires for your Outer Banks kitchen remodeling. With 50 years of experience on the beach, from Ocracoke to Corolla, Outer Banks Custom Kitchens can give you the kitchen of your dreams.